We’ll be looking at both types. For this guide, we’ll create an entity to test our collision code. This entity will need to be collidable (implements ICollidable) and needs logic for movement in response to input. 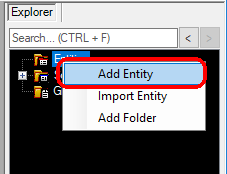 The new entity should appear in the Entities folder in Glue. 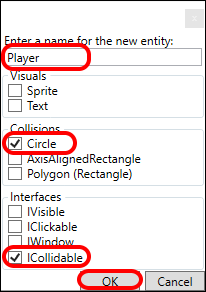 Since the Player entity has its ImplementsICollidable set to true, any shape (Circle, Polygon, AxisAlignedRectangle) in the entity will be used in collision functions. Our entity is ready to go – we just need to add it to GameScreen. Note that we’re adding the Player to the GameScreen rather than Level1 because we want every level to have a player. The Player will now appear on the game screen and can move with the arrow keys. Solid collision can be used to prevent an entity from passing through solid objects on a tile map. 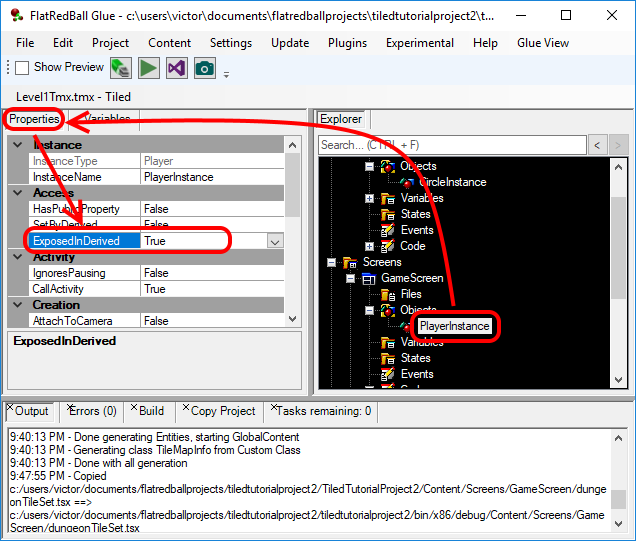 In this example we’ll be colliding the Player instance against tiles that we set up to have rectangle collision in the previous tutorial. Note that we are going to write this code in Level1.cs for the sake of simplicity. The code above is useful for showing how to write collision code, but it suffers from being written in our Level1.cs file. A real game may contain multiple levels and we want to avoid duplicating the collision code in every screen. Instead, we’ll want our collision code to live in the GameScreen.cs file, at least if it’s intended to be common functionality. 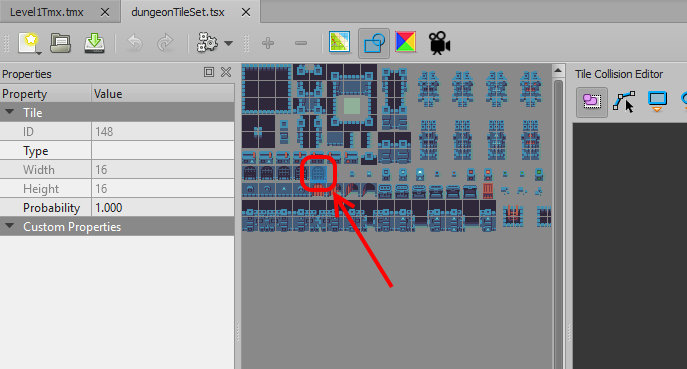 This introduces a little bit of complexity – we want the collision logic in GameScreen, but we have our level TMX file (and assocaited collision) in the Level1 screen. We can solve this problem by creating a collision object in GameScreen, then assigning it in Level1. The game should behave the same as before, except now the code is in the core GameScreen which means if will be shared when we add more levels in a future tutorial. A TileShapeCollection can only be created from a single layer. Some games may want to create collision from multiple layers into a single TileShapeCollection. All collision from a single layer can only be added to a single TileShapeCollection. Some games may paint tiles with different types of collision in a single layer. TileShapeCollections can be constructed and populated in code in a variety of ways. For example, collisions can be created from tiles by the properties added to those tiles. Enter a name for the property. This property will be used in code to add collision. For example, we’ll add a property HasCollision. Note that we will simply use the presence of this property to add collision so the type doesn’t matter. Click OK to add the new property. This can be repeated for any tiles which need to have collision. Next we’ll add collision for these tiles in code. We can either add collision to a TileShapeCollection created in Glue or we can create our own in code. For the sake of this example we’ll create one completely in code. 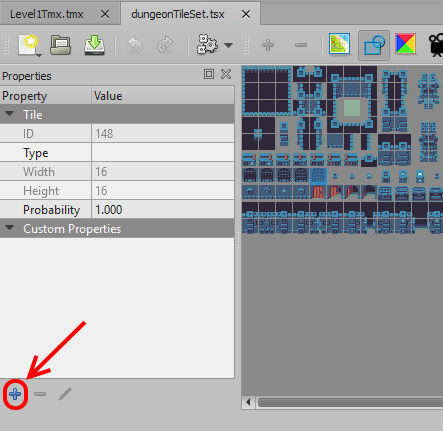 To do this, modify the Level1.cs file to contain the following code (only code relevant to creating the TileShapeCollection in code is shown). AddCollisionFromTilesWithProperty can be called multiple times, adding additional shapes. 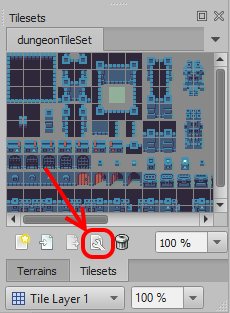 This allows you to create one TileShapeCollection from many types of tiles. TileShapeCollections can be created in code or in Glue. 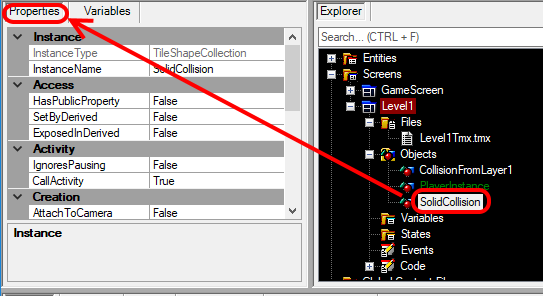 TileShapeCollections can even be defined in the base GameScreen, then assigned in a derived (level) screen’s CustomInitialize. 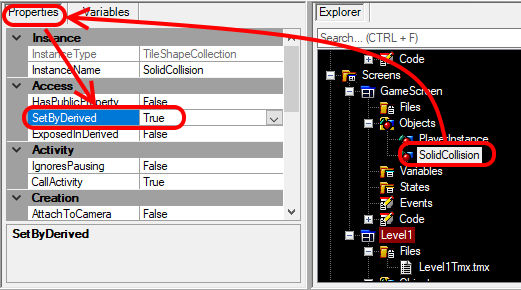 TileShapeCollection provides many methods for creating collision, including placing collision one tile at a time. See the TileShapeCollection class for more information. 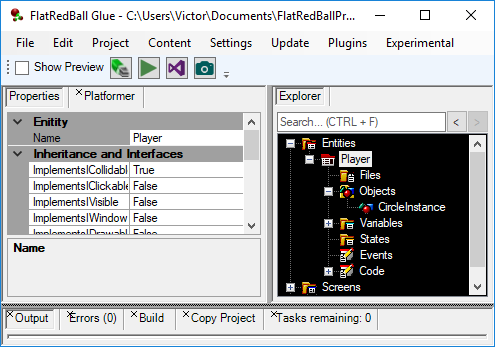 This guide shows how to work with TileShapeCollection to perform solid collision (collision which prevents an entity from passing through the collision area) and non-solid collision (collision which is used to drive custom logic). A typical game may include many TileShapeCollection instances for different types of collision. Although we didn’t cover it in this guide, the TileShapeCollection class uses axis-based partitioning for efficient collision. In most cases, even mobile platforms will be able to perform collision against TileShapeCollection instances with tens of thousands of rectangles with very little impact on performance. Developers interested in the details of this partitioning are encouraged to look at the TileShapeCollection source code.